July 16, 2007-- Dennis Heaphy, 47, is a fourth-generation tinsmith. Since 1892 the Heaphys have been banging metal in Syracuse, and Dennis, who started in the trade when he was 11, is the last in that long line. Heaphy moved to New York City in 1999 to pursue his other passion - theater. He worked as a contractor to support himself, and early in 2000 he took a job working on a theater on Ellis Island, where he was supervised by a Parks Department chief. On a break, Heaphy asked how he could become the Statue of Liberty’s resident tinsmith. Three weeks later he was hired, beginning his love affair with the iconic lady of the harbor. Today he does all repairs on the statue, as well as giving demonstrations of his antiquated craft. Dressed in a period shirt, with a collection of ancient metal tools, Heaphy looked like he’d stepped out of 1886 when The Post caught up with him on a recent afternoon. A bear of a man with a low, rumbling voice, Heaphy has the cheery demeanor of a man who loves his work, and his laugh echoes around the island. I do two different jobs. I do any metalwork needed on the statue, and I also do demonstrations for the public, showing them how it was built. I’ve taught school in the past, so this is one job I’m uniquely qualified for. It’s like I’m doing exactly what I should be doing. 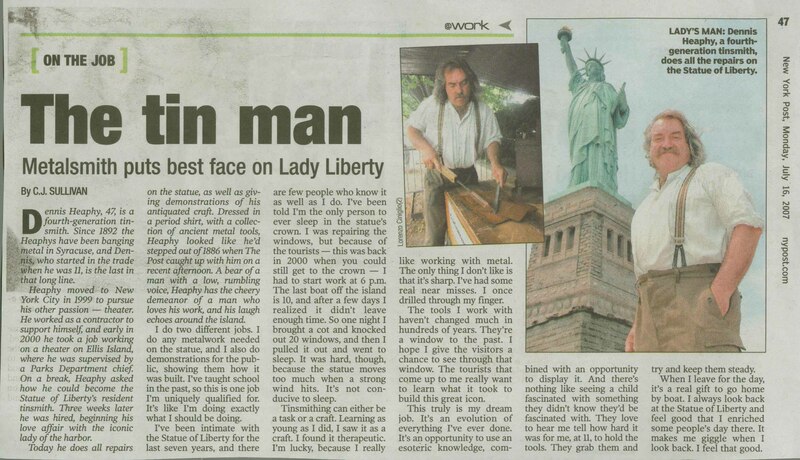 I’ve been intimate with the Statue of Liberty for the last seven years, and there are few people who know it as well as I do. I’ve been told I’m the only person to ever sleep in the statue’s crown. I was repairing the windows, but because of the tourists - this was back in 2000 when you could still get to the crown - I had to start work at 6 p.m. The last boat off the island is 10, and after a few days I realized it didn’t leave enough time. So one night I brought a cot and knocked out 20 windows, and then I pulled it out and went to sleep. It was hard, though, because the statue moves too much when a strong wind hits. It’s not conducive to sleep. Tinsmithing can either be a task or a craft. Learning as young as I did, I saw it as a craft. I found it therapeutic. I’m lucky, because I really like working with metal. The only thing I don’t like is that it’s sharp. I’ve had some real near misses. I once drilled through my finger. The tools I work with haven’t changed much in hundreds of years. They’re a window to the past. I hope I give the visitors a chance to see through that window. The tourists that come up to me really want to learn what it took to build this great icon. This truly is my dream job. It’s an evolution of everything I’ve ever done. It’s an opportunity to use an esoteric knowledge, combined with an opportunity to display it. And there’s nothing like seeing a child fascinated with something they didn’t know they’d be fascinated with. They love to hear me tell how hard it was for me, at 11, to hold the tools. They grab them and try and keep them steady. When I leave for the day, it’s a real gift to go home by boat. I always look back at the Statue of Liberty and feel good that I enriched some people’s day there. It makes me giggle when I look back. I feel that good.